May 2010, Johannesburg, South Africa. After being able to have only one child, Ruth Renlund became a personal injury trial lawyer. At the peak of a long and fulfilling professional life, Ruth has now become the wife of a General Authority serving in South Africa. In her interview, Ruth discusses the challenges of having an only child within Church culture, and how she’s transitioned from being an independent professional to serving with her husband in a foreign country. Did you always plan on a career in law? Not really. I grew up in Salt Lake City, the second of six children in a family where education was encouraged. My father was a lawyer who defended insurance companies and my mother was a registered nurse with a bachelor’s degree. I had an early interest in the law, but was discouraged by my father from pursuing it. He had a low opinion of women lawyers because he felt that the time demands were too high for it to be compatible with raising a family. This was in 1976, so I finished my undergraduate work at the University of Utah quickly and then went on for another year to get a teaching certificate. I taught English and debate for three years at South High because that’s what they needed, even though my background was in history and French. I married Dale Renlund after college and planned to teach until he finished medical school. Then I’d raise our family and after that I planned to return to some kind of graduate work. A cross-country move for your husband’s medical training, a new baby, and an unexpected illness led you down a different path that ended up with you going to law school. What happened during that period of time? We moved to Baltimore, Maryland for my husband’s internship and medical residency. I had my daughter, Ashley, one week before Dale started his internship. A year later when I was 25, when Ashley was just sixteen months old, I was diagnosed with ovarian cancer. The disease is very rare in young women; it’s commonly found in older childless women. Thankfully it was caught early. I underwent a total hysterectomy, nine months of chemotherapy, and a second surgery. My doctor told me that if I survived five years I would be considered cured. I didn’t expect to have a huge family, but I always thought we’d have more children, so we grieved when we found out that we’d only have one child. Of course, adoption was an option, but because my health was uncertain, we weren’t sure if I would be around to raise the child I had. I prayed for guidance, and at that point we knew our family was complete. I was impressed to go to law school and fulfill a deep-seated desire. How did you balance school and motherhood, since your husband was also in a rigorous training program? When Dale was a resident he had a demanding call schedule, on call every third night. You don’t just marry a person, you marry a lifestyle. So I was basically a single mother, and when I embraced that it became easier. At that same time he also was called as the bishop of an inner-city ward, so when he wasn’t at work he was doing Church business. I treated school as a nine-to-five job. I arranged for all of Ashley’s childcare, preschool, and after-school arrangements. I’d go to school, come home, spend time with Ashley, and then study at night. During finals Dale would take her with him on home visits while I studied. It actually worked out quite well because no one could refuse letting him into their home with such a cute four-year-old. How did your law career progress and what have been some of your most rewarding professional experiences? I enjoy the intellectual challenge and helping clients solve their problems. Law crosses all aspects of life, so I could be a generalist and still have interactions with business and people. After finishing law school at the University of Maryland, I began at the Utah Attorney General’s office, working to bring lawsuits on behalf of the state. I enjoyed it, but came to a point where I wanted to work more closely with individuals, so I searched for a firm where I could do that. I ended up doing personal injury trial work. I’ve handled multi-district litigation representing hundreds of clients as well as individuals with catastrophic injury cases. Working with clients and becoming almost like family at difficult times is very rewarding. I’ve gotten high school graduation announcements, wedding announcements, and so forth from former clients. I also encounter many of the same attorneys on the other side of the aisle in trials so I’ve come to know people and respect them. It takes time to build those relationships, but they’ve been very fulfilling over the years. How did you juggle your various roles as Ashley was growing up? It went day to day. Some days I had to be Mom and was home. Other times I had to be the lawyer and stay late at the office to take care of some work. Other times I had to be the spouse. It doesn’t equally play out each day. You have to respond to the situation that’s there. It was nice because my mom lived close and Ashley went to her house on Fridays when she had a half-day of school and got to spend time with her grandma and cousins. I prayed for guidance, and at that point we knew our family was complete. I was impressed to go to law school and fulfill a deep-seated desire. How did you nurture your relationship with your spouse amidst your busy schedules? We planned vacations and weekend getaways six months out and held dates firm. We resisted when life encroached. Dale worked in cardiology doing heart failure and heart transplant medicine. He did a fair amount of international travel so I’d take time off work and travel with him. We also took regular family trips. Sometimes we could get away for a week, other times two days. We also tried to do date nights, which often involved attending a church meeting. Sometimes stake conference would be our date night. We also always tried to catch up in the evening. If he couldn’t come home, he’d call. Thank goodness for phones. What reactions did you receive, if any, about having one child in a church where large families are the norm? People can be very judgmental and it was often hurtful. People who knew us and our situation were understanding, but others would often ask, “How many children do you have?” When I responded, “One, and we’re so thankful for her,” they often looked surprised. Maybe this is rude, but if people started to pry I’d just tell them that it was none of their business. Even with one child, I heard comments like, “When will you have a family?” I do have a family! Ashley once asked me when she was going to get a big sister and I told her that ship had sailed, but that one of the benefits of being an only child was that she could travel with us. You can’t do that easily with a larger number of children. When my father was serving as a general authority in Hong Kong, Ashley went with me to visit them. She also went with us to China, Paris, London, and other places. We told her she could go anywhere she wanted for school because our entire education budget was available to her. One of the reasons we moved back to SLC from Maryland was so that Ashley would have a sense of family beyond her parents. She had her cousins nearby, many of whom were close to her in age. What was your reaction to your husband’s call to the Quorum of the Seventy and subsequent assignment to South Africa, since it had such big implications for you as well? What was involved in wrapping up two careers before embarking on your new adventure? It was busy. I met with every client to let them know I’d be leaving. I discussed cases with my partners to decide which would be the best fit for each situation and to ensure a smooth handoff. I got mixed reactions when people found out I’d be leaving to help supervise missionary and humanitarian work in Africa. Some said, “Good for you, Ruth. There’s more to life than being a lawyer.” Others responded, “How can you leave when you’re at the peak of your career?” I just tried to explain my commitment to my church and my faith. I worried about that when he got called because as the spouse you have to create your own role. 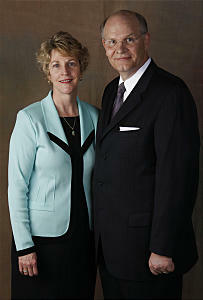 I travel extensively with him to mission tours, stake and district conferences, and on other assignments. I do a lot of speaking and training of women auxiliary leaders. We’ve averaged one mission tour a month and are gone for seven to ten days at a time. We’ve been to the Democratic Republic of Congo and recently returned from Uganda. Dale and I have had a chance to work together as we discuss our meetings. One of us will discuss what we addressed in our trainings and suggest ideas for what the sisters or priesthood brethren need to hear. It’s our first time with somewhat of a joint calling and I’ve enjoyed it. In addition, I have two official callings. First, I was asked to write the history for the Africa Southeast Area regarding the activities of the area presidency. I just finished the 2009 area history and am working on the 2010 edition. Second, I’m on the public affairs committee. I work to help the Church and its mission to become better known. We also have fifteen senior missionary couples and I help get them acclimatized to the area as far as managing how to function in this new, unfamiliar environment. How have you been able to use your skills and talents in your work in Africa? I am a problem solver and no matter where you are, there are always problems to be solved. We just went on a mission tour to Uganda and there are twenty issues that need to be resolved, like getting curriculum distributed to the Saints. So we have to find who’s responsible and go through the proper channels. I’ve also begun blogging, which has been very fun. I take pictures of our experiences because there’s no way you can describe Africa in words. How have you grown as a result of these new experiences? What have you learned from the African culture and people? I’d like to think I’m more tolerant, less judgmental. President Hinckley spoke of our church as a great worldwide family and I thought, “Of course.” But it’s different when you have a face with it. I’m more appreciative of the blessings I have. Our experience has been heartwarming and heartbreaking at the same time. These people have nothing as far as the world’s goods, but those with the gospel feel rich. The people know their Bibles very well and treasure them. The work is going well here because many have a believing heart and they recognize the truth. They also have the challenge of working against cultural traditions. I was just in a gospel doctrine lesson where a new convert was teaching about the trials Joseph faced in Egypt. She was the only member in her family and they just found out that her niece had leukemia, a rare disease in Africa. Her family accused her and her new church of bringing this disease upon her niece as a result of witchcraft and praying in their temples. She understood trials, but it was still so sad to hear of such a situation. The people will walk 45 minutes each way to church and then stay all day for services and then for a fireside. While we were in Uganda, a group of Saints camped out overnight on the church grounds because they were too far from home and couldn’t afford to make it back for the next day’s meetings. So we had missionaries calling us on a Sunday morning asking if it was all right if they bought food for these people. The women dress in beautiful clothing for church with their bright colors and elaborate headdresses. They are very committed and faithful. Do you think that there’s a difference in Africa with having more of the essence of the gospel than cultural influence that might exist in a more Western area? Yes, that’s a good way to put it. We were working with RS leaders recently and asked them what challenges they were facing. They responded that they had a hard time getting the women to come to stake quarterly enrichment meetings. I asked about what other meetings they were required to attend and they mentioned that they held meetings every Wednesday where the women would get together and share recipes, knit, talk about parenting, and learn other skills. I was astounded. They held these weekly meetings and had great attendance because the culture is agriculturally based so there’s nothing going on at night. We asked if there were any literacy needs and they replied that they were helping women learn to read, so it sounded to me like the women’s needs were being met, which is what’s important. Our only suggestion was that perhaps they incorporate some of the Enrichment nights with the existing weekly meetings. I was just surprised that with all the poverty and physical hardship that their concern would be about attendance at enrichment night. How was the transition for you to Africa as far as culture, security? It’s a big difference. Salt Lake really is a small city and Johannesburg is a big city, so everything just takes longer, even just the basic things such as getting around and going to the grocery store. Security is also very different. We are surrounded by walls and I can’t get out of our house without using at least three keys. There are no such things as deadbolts in Africa. There are keys to the bathroom, keys to the pantry, etc. We also travel places that the locals say that they don’t even go. Driving on the left side of the road has also been an adjustment. What have you learned from your life experiences so far? One thing I’ve always felt strongly about is that there’s no one way to be an LDS woman. Each has a right to personal revelation and is expected to use that. It should be personal and we shouldn’t let other people’s comments shake our direction. I think women are particularly susceptible to that. Interview by Nollie Haws. Photos used with permission.